I love finding new books from authors with different voices. Often, their characters are refreshing and also speak with different voices, representing populations that open my eyes to people I might otherwise overlook. 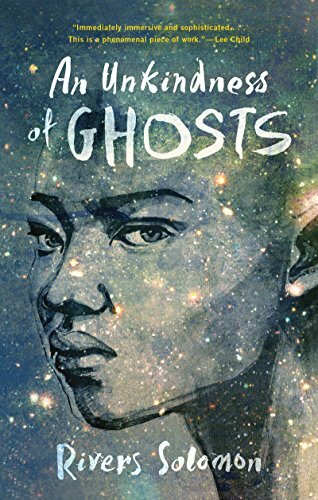 Rivers Solomon is such an author, and the lead character “Aster” in An Unkindness of Ghosts has that voice. Aster is poor, mixed race, sexually ambivalent (“they” is the preferred pronoun for the character–and for the author), and leaps off the page with fire and rage. The Matilda is a spaceship that has been searching for a new home for humanity for centuries. On board the spaceship, differences between race and class mean everything. A religious/military government, basically comprised of white people, rules harshly over the entire ship. Lower decks are lower class–and largely black or brown in skin color. Into this stratified world walks Aster. Aster is brilliant in many ways: studying under the ship’s Surgeon General Aster has learned traditional medicine. Aster has also learned from books and from experimentation how to grow plants and distill medicines that replace those withheld from the lower classes by the ruling elites. That genius is both recognized and resented by people throughout the ship. Others with darker skin appreciate the skill, but resent that Aster has access to parts of the ship they cannot visit. Guards and rulers also appreciate Aster’s skill, but feel compelled to remind Aster constantly that they are in charge. Aster is a freak, and few can see past the freakishness to appreciate the person inside. An Unkindness of Ghosts is a powerful book, creating a world that pulls the reader in. It is dark. The book does not offer easy answers, it does not end with “and they lived happily ever after.” Aster is a survivor. Sometimes, survival is ugly. It is also triumphant, though. Aster’s answers may not be the answers they, or we, were looking for. But life often refuses to give the answers we want. What matters is what we do with the answers we are given. An Unkindness of Ghosts demands that we examine who the “freaks” are–those who are born differently, who choose a different path, who wear a different skin, who love fiercely the people they love whatever their gender, or those who draw lines between “us” and “them,” who use skin color and gender to divide, who treat power as the opportunity to abuse and mistreat. The Matilda may be a dystopian nightmare. Perhaps, that type of misery is the fertilizer needed for an Aster to fully bloom.